This tea is produced by the Himalayan Shangri-La Tea Producers, a tea garden that is nourished by pure water from the Himalayas and grown free of pesticides by small farmers that own their own land. Shangri-La Gold is a rich, luscious tea with some cocoa notes and a surprise wisp of rose. Enjoying a cup of Shangri-La Gold not only satisfies your senses but also your heart. Take a respite from your worldly troubles and let this tea transport you to its tea garden surrounded by high mountains near the top of the world. By buying high quality, artisan crafted Nepalese tea, you can count yourself as a part of the solution for Nepal’s problems. My friend, Jeni, of Jeni’s Tea witnessed first-hand the devastating 7.8 earthquake in Nepal and the subsequent humanitarian crises resulting from the embargo that denied Nepal of 70% of critical imports for nearly 9 months. She advocates trade rather than aid, to create long-term stability for this struggling country. Use 6g of leaves for 6 oz. of spring water. Rinse the leaves once with boiling water and discard the water. Then brew according to the recommended steeping times below. 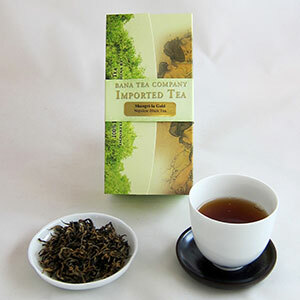 I tried this tea since I have tried several of Banas' pu-erh teas, and enjoyed them all. This one caught my eye because it was listed as a black tea, and because the description included a hint of "rose" in the flavor. I enjoy it because it is brewed like a pu-erh - quickly (and frequently), but tastes like a black. Very smooth, very little tannin taste. And the little breath before the sip - is roses! Delightful! This is a very special tea. Yes, it is a black tea, but each sip ends with a heavenly note of rose. This is not a floral tea with that imitation perfume aroma. I could sip it every day or serve it to some "royal" guests! I ordered this tea after receiving a sample with a previous order. It has an excellent flavor and is not astringent and can be brewed about three times.